Each frame in this analysis is .1 second apart. 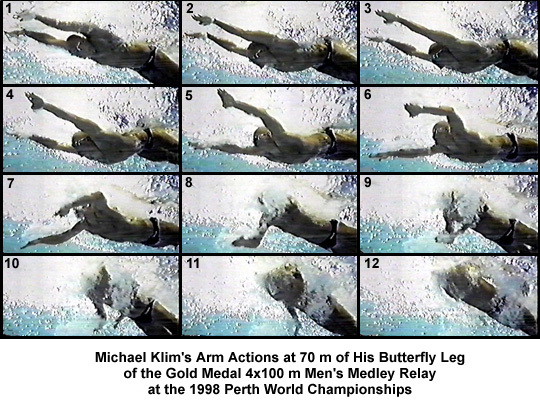 Frame #1: Arms enter the water fully stretched with hands flat and relatively close together. Flexion at the hips suggests that downward forces created by the arms and/or torso have to be counter-balanced by a lower body movement. Frame #2: The hands remain stationary while the head and shoulders continue to travel downward. Further piking at the hips occurs. As the exaggerated upper body thrust occurs in a vertical plane, the hips are forced to react and rise vertically. In this frame the upper body has moved a greater distance than the hands. Frame #3: The hands are moved sideways creating a force that acts to slow the "diving" action of the head and shoulders. Further piking at the hips illustrates a detrimental body alignment that inhibits streamlining. The head begins to rise and look forward. Frame #4: Sideways hand pushes continue to create forces that will halt the downward plunge of the upper body. To this point the head and torso have moved much greater distances than the hands. The arms or hands have developed no backward propulsion. The head continues to rise and look further forward. Frame #5: Sideways hand pushes continue but upper arm adduction and bending at the elbows occur resulting in increased power. Hand pitches begin to change. These features start to elevate the head and shoulders which in turn cause a reaction in the hips, that is, they start to drop down. Continued lifting of the head also contributes to the hip-drop reaction. It should be noted that this vertical movement of the hips does not create or even facilitate any propulsion. The massive amount of water that is moved (wave resistance) would consume large amounts of energy. It could be this factor that limits Klim to being the world-record holder and champion in 100 m butterfly while also being the world champion in 200 m freestyle. This stroke would not be desirable for 200 m although it has characteristics that are similar to those of Frank Esposito. Frame #6: Further adduction and elbow flexion is exhibited. Horizontal (backward) propulsion increases. The hips continue to sink producing a more streamlined body alignment. The head looks directly forward. Frame #7: Medial rotation of the upper arms occurs at the same time as adduction and elbow flexion. This reorients the propulsive surfaces of the hands/forearms to generate greater horizontal force components. The head looks directly forward but hyperextension of the neck appears to reduce the impact of that body segment movement on overall alignment. Frame #8: Extremely powerful adduction of the upper arms occurs. The very large drag forces that are developed in a largely horizontal plane are evidenced by the large and obvious turbulence occurring on the back of the hands/forearms. The angle of the hands/forearms is not vertical. Some downward force has to be created to continue elevating the upper torso and head to enable breathing. The head breaks the surface preparatory to breathing. A streamlined body position is maintained. Frame #9: Propulsive drag forces continue to be developed being powered primarily by adduction of the upper arms. The vertical angle of the arms remains slightly offset from true vertical as the shoulders and head rise even further. Body alignment remains streamlined. Frame #10: Propulsion due to adduction of the upper arms nears completion. The arms begin to slide up and backward as extraction is initiated. This additional vertical force component begins to be counter-balanced by kicking, the dropping of the knees and hip-flexion being evidence of that action. Frame #11: Inhalation occurs as the arms complete propulsion and begin to be extracted. The knees rise as the lower legs kick down. Frame #12: Arm extraction occurs. The body remains in a streamlined position. Michael Klim's stroke is testimony to his innate power. Once he begins propulsion his stroke is very powerful and his body is streamlined. However, propulsion halts at the entry and repositioning of the arms phase of the stroke. That large inertial lag, which is both energy sapping and inefficient, unnecessarily slows and fatigues the swimmer. It would be mechanically more beneficial to maintain streamline for as much of the stroke as possible, eliminate detrimental vertical forces produced by an exaggerated head and shoulder diving at entry, and to initiate propulsive arm movements earlier. These factors are not independent of each other and so changing one could improve or change the other elements. Michael Klim could be considered to be a world-champion and record-holder because he is an extremely powerful man. If his technique was more accurate and efficient he could produce exceptional performance levels in this swimming stroke. However, unless technique changes are made it is unlikely that his race performances will improve.